속칭 전곡사지라고 일컫는 망제동의 서쪽 산기슭에 위치한 탑으로 낮은 단층기단 위에 7층탑신을 올린 방형 평면의 석탑이다. 이 석탑은 8매의 석재로 구성된 지대석 위에 1매의 판석형 석재로 조성한 낮은 단층기단을 놓았다. 기단은 거칠게 다듬었으며, 측면에는 아무런 조식도 없다. 측면 상단에는 갑석형의 굽을 돌렸는데, 상면은 약간 경사지게 다듬은 후 중앙에 낮은 받침을 조출해 탑신을 받고 있다. 이와같은 기단구조는 통일신라시대의 석탑에서는 볼 수 없는 특이한 형태로 운주사석탑군에서 볼 수 있어 고려시대에 시작된 기단의 한 유형임을 알 수 있다. 탑신부는 초층탑신으로부터 3층탑신까지를 제외한 나머지 탑신과 모든 옥개석이 각각 한 돌로 조성되었다. 초층탑신은 유난히 세장(細長)하고 방주(方柱)같은 4매석으로 구성되었는데 각 면에는 우주의 표현이 없다. 그 위의 2·3층탑신석은 각각 2매의 석재로 조성되었다. 매 층 각 면에는 양 우주가 각출되어 있다. 전체적으로 볼 때 초층탑신이 유난히 높게 조성되었고, 2층 이상은 체감률이 적은 탓에 석탑 자체가 고준(高峻)해졌다. 옥개석은 초층부터 7층까지 같은 형태로 조성되었는데, 너비가 좁고 두꺼워서 둔중한 느낌을 준다. 옥개석 상면은 평박하여 낙수면이 완만한 경사를 이루고 있으나, 합각부의 선은 예리하게 조성됐다. 정상에는 각형 1단의 받침을 조출해 상층의 탑신석을 받고 있는데, 7층에 이르기까지 공통된 양식을 보이고 있다. 각 층 옥개석의 하면에는 수평으로 전개된 추녀에 얕은 낙수홈이 모각되고 받침부에는 연화문이 조각되었다. 연화문은 모두 앙련으로 추녀부의 측면부터 탑신에 맞닿은 안쪽 면까지 가득히 조각한 까닭에 자연스레 그 문양이 세장한 형태를 이루고 있다. 1변에 4판씩 모두 16판의 앙련이 조식되었는데, 판 내에는 아무런 장식이 없다. 이러한 연화문장식은 전각부에 미세한 반전을 강조할 뿐만 아니라, 옥개석의 폭이 좁아지는 느낌을 주어 전체적으로는 석탑이 더욱 세장하면서도 고준해보이는 효과를 주고 있다. 이처럼 옥개석의 하면에 연화문을 조각하는 것은 통일신라시대에 조성된 남원 실상사 백장암삼층석탑에서 볼 수 있는데, 고려시대에도 흔히 볼 수 있는 양식은 아니다. 상륜부재는 모두 없어지고 7층옥개석 위에 노반석 하나만 놓여 있을 뿐이다. 이 석탑은 옥개석의 양식이 특이하여 이형석탑(異形石塔)으로 분류되고 있다. 전체적으로 석재결구가 매우 간략화 되고, 연화문의 조각 또한 치졸함을 보이고 있을 뿐 아니라, 안정감이 결여된 세장 · 고준함 등으로 보아 고려 중엽 이후에 건립된 것으로 추정된다. Cheongoksa Temple was built by a religious leader named Jajang during the reign of Queen Seondeok of Silla. 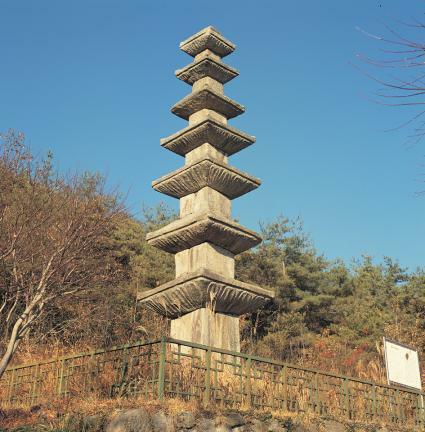 Suffering from a skin disease, Queen Seondeok ordered him to build the temple and called it Cheongoksa, as she cured her disease with the mineral water from under Cheonggongnyeong Pass. Only a sanctum and Yosachae Hall, the residence of monks or nuns, now remain, and the history of this site since its foundation is unknown. 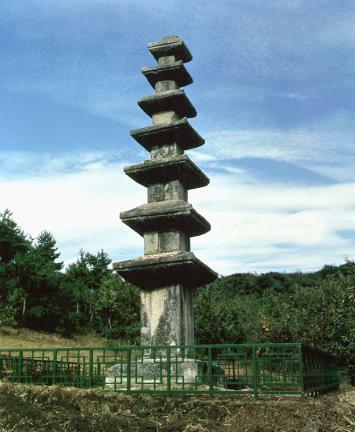 This pagoda was built at the base of a mountain in the west of Mangje-dong called Cheongoksa Temple Site. The present location and structure seem to form a circle. The 7.5 meters high pagoda and the base that supports it look very simple. The main stone of the first story is a large, four-tiled stone. There are two stones for the second and the third stories and one for the fourth story. Each roof stone was made of one stone, almost leveled, with lotus patterns sculpted on the bottom. At the top of the pagoda, only the base of the finial now remains. It is unusual that the lotus design is engraved in the bottom of the roof stones. Although the stones in each part were loosely arranged, this structure is important to the study of unusual stone pagodas. Judging from the style and the simple carving technique, it is assumed to have been built in the Goryeo Dynasty.